Zoom in to see it! Selena Gomez's gorgeous Coach Met Gala look was very long, see-through, ethereal, and extremely bronzed. 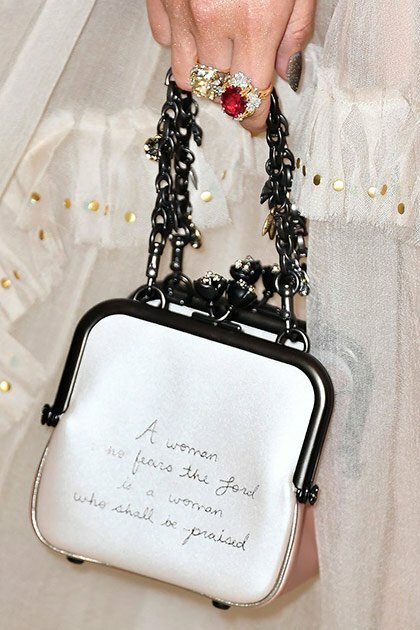 All of these aspects have been discussed, but you may have missed this one important detail: a religious message written right on the front of her handbag. In case you can't read it easily, it's a Biblical passage from the book of Proverbs that reads, "A woman who fears the Lord is a woman who shall be praised." According to an Instagram post by Coach, this was a personal touch that came directly from Selena, and was actually embossed with her own handwriting. This little note may remind you of a similar one Selena wore on the underside of her bag last year: "Love yourself first." Keep the personal touches coming, Selena! Love a look that has ~layers~.